WordPress is easy to use but contains a few gotchas for the uninitiated. We discuss five tweaks that will improve any new WordPress install. Although WordPress is fairly easy to get to grips with, if you’re new to the world’s most popular CMS, it’s easy to miss a few simple tweaks that can seriously improve productivity and the effectiveness of your site. Some of the default choices baked into WordPress aren’t ideal, and every experienced WordPress user will run through a checklist of changes after installation. I had to learn these tips through trial and error — and believe me, I made many errors in my early WordPress days. My life would have been quite a bit easier had someone taken the time to let me know about the tips I’m about to tell you. Overall, WordPress is fairly secure. In most cases, the chinks in its armor are the result of user error, particularly when it comes to choosing good passwords and usernames. Out-of-the-box, WordPress comes with one user that has administrative privileges — the user that can fully control all aspects of a site. That user is called “admin”. Hackers know this, so when they embark on brute force attacks, they focus on the “admin” user, hoping that it will have an easily guessed password. Getting rid of the admin user will stop a significant percentage of potential attackers in their tracks. You can’t actually change the name of a user, so you should create an alternative user with administration privileges and use it to delete the admin user. The default URL scheme in WordPress is, quite frankly, terrible. It looks bad and it does sites no favors when it comes to search engine optimization. 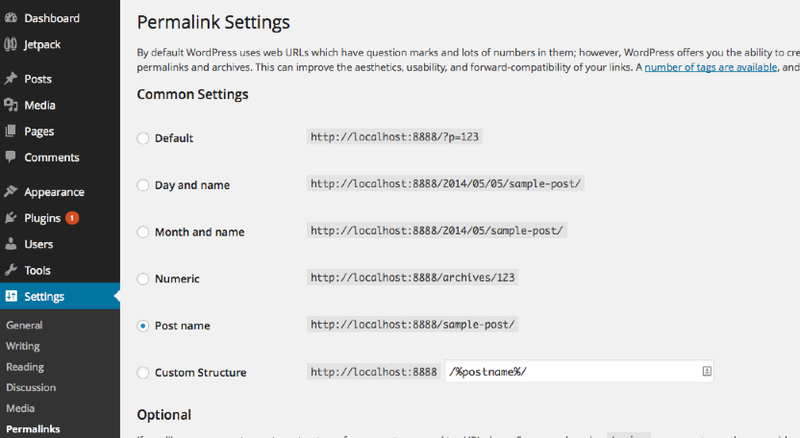 You can find the permalink settings under the “Settings” menu in the WordPress admin page sidebar. I prefer the “Post Title” option, but there are various schemes you might want to use. Just make sure that it contains the title of the page somewhere so that users and search engines can see it. Spam comments are a serious problem for WordPress administrators. They’re a completely bogus strategy, but apparently, the message hasn’t got through to spammers yet. Fortunately, the Akismet plugin will handle most problem comments. It’s installed by default but you’ll need to activate it and head over to the Akismet site to get an API key. See the instructions in the Akismet plugin description on the WordPress plugin page. In a new install, WordPress isn’t particularly SEO-friendly. There are various plugins that will create sane defaults for SEO and allow site owners to easily add the meta description and title tags that SEO best practices advise. My favorite is the Yoast SEO plugin, but there are alternatives, including the All in One SEO Pack. As a dynamic site generator, WordPress is quite slow compared to a static site. But static sites are difficult to manage properly, especially when there are multiple contributors — which is why people use a CMS in the first place. Using a caching plugin is a happy medium: you still get all the benefits of a content management system, but most pageloads are pre-generated and load much faster than they would if WordPress had to process PHP and make database calls for every page load. W3 Total Cache is my usual choice, but WP Super Cache is simpler and is the better option unless you want to play with dozens of caching settings. Of course, there are hundreds of potential tweaks and plugins that can be used to change WordPress into your perfect site, but with these five tips, you’ll be off to a good start. About Matthew Davis — Matthew works as an inbound marketer and blogger for Future Hosting, a leading provider of VPS hosting. Follow Future Hosting on Twitter at @fhsales, Like them on Facebook and check out their tech/hosting blog,http://www.futurehosting.com/blog.